Increasingly, some of the biggest tech giants are turning to these two-year schools to find the skilled workers they desperately need. , 30% of those with an associate degree now out-earn the average holder of a bachelor’s degree. One reason tech companies turn to community colleges is that they may have need of candidates they can’t get elsewhere. Someone with an associate degree in cloud computing out-earns someone with a bachelor’s in English literature. Long stigmatized as “junior,” community colleges might seem like an unlikely source of talent for major tech companies. Yet, increasingly, some of the biggest tech giants are turning to these two-year schools to find the skilled workers they desperately need. Americans are burdened with about $1.4 trillion in student loan debt. One in four has a low wage job, which is by far the highest proportion of any advanced economy. Meanwhile, there are hundreds of thousands of open positions in the U.S. in fields like cybersecurity, cloud computing, computer programming, data science, tech support and skilled manufacturing. In many of these fields, the “skills gap” between available candidates and open positions is only projected to grow. In the U.S. there are already half a million core technical workers in the high tech industry who do not have a bachelor’s degree. Borrowing a page from the construction and manufacturing industries, the tech giants are setting up apprenticeships, new certifications and even degrees. These are exactly the sort of programs encouraged by President Trump’s June 2017 executive order that sought to make it easier for companies to set up Germany-style apprenticeship programs, though their genesis for the most part predates his presidency. Tuition costs at community colleges are typically less than half those of an in-state four year institution. As a result they tend to attract low-income students and members of racial minorities, another reason tech giants—which are lately being held accountable for their poor diversity numbers—are interested in them. There’s promise in this strategy: Because of a growing difference between wages for different kinds of jobs, 30% of those with an associate degree now out-earn the average holder of a bachelor’s degree. In other words, no one should be surprised when someone with an associate degree in cloud computing out-earns someone with a bachelor’s in English literature. Yet since many of these programs are so new, it’s too early to say whether or not they are successful. Sam Edwards, a 20-year-old student at Wake Tech Community College in Raleigh, N.C., embodies both the opportunity and the challenges facing students who choose this route. Wake Tech offers internships with companies that have local offices, including IBM, Lenovo and Cisco, and also does continuing education for employees of companies such as Infosys and Credit Suisse. Five years ago Wake Tech had fewer than 20 students doing internships at companies like these. Today it’s in excess of 400, says college President Stephen Scott. Overall, the college serves 74,000 students, 90% of whom are part-time, he adds. Mr. Edwards, for one, has three part-time gigs, primarily in tech support. This allows him to work remotely and balance them with his studies. As someone who used to be in foster care, he was eligible for Wake Tech’s Fostering Bright Futures program, which was established to help address the challenges faced by young people who were once in foster care. The program provides Mr. Edwards, who describes Bright Futures as a “second family,” with living expenses, mentors and a faculty contact he can call anytime, to help with nearly any issue, from finding a place to live to buying a car. Amazon recently launched, in partnership with Northern Virginia Community College, both an associate degree in cloud computing and an apprenticeship program in which Amazon pays students to get a degree in cloud computing, in preparation for a full-time job at Amazon. One reason tech companies turn to community colleges is that they may have need of candidates they can’t get elsewhere. For example, all of the 130 apprentices in the Northern Virginia program are military veterans. One reason Amazon pursues veterans is that so many have already have government security clearances, says Chad Knights, dean of math, science and engineering at Northern Virginia. Security clearances, which must be employee-sponsored and can take years to get, are a necessity for Amazon employees who will work on data centers that handle sensitive government data. Amazon also says it wants to address high rates of veteran unemployment by hiring 25,000 veterans by 2021. Tesla has announced partnerships with two community colleges to train people to assemble and service electric vehicles, and is in talks with at least one more, Miami Dade College, to expand the program, says the dean of MDC’s engineering and technology department, Antonio Delgado. Tesla works with Miami Dade College in part so it can recruit people who are still underrepresented in tech, like members of racial minorities and low-income students, says Mr. Delgado. Amazon’s apprenticeship program and Tesla’s 12-week training program are unusual in that they lead directly to jobs at those companies. 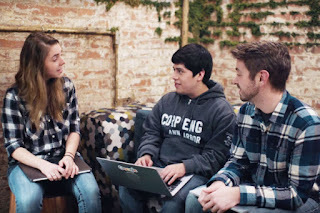 Google recently announced it is partnering with 25 community colleges in seven states, as well as more than a dozen companies including Walmart, Hulu, Sprint, GE and Bank of America, to launch an IT-support professional certificate that students can earn in eight months. Certification programs tend to be more about training students to go to smaller firms where they can use the technology of the companies sponsoring the programs, such as Amazon’s cloud services and Google’s web apps, not about recruiting for these companies, says Debbie Hughes, vice president of higher education and workforce at the Business-Higher Education Forum, a not-for-profit sponsored by government grants and Fortune 500 companies in need of talent. The challenge for community colleges in particular is that companies may say they are more willing than ever to hire based on skills rather than education, but analyses of their hiring patterns and job postings reveal they still favor workers with traditional four-year degrees, says Ms. Hughes. Which means students like Mr. Edwards, who have already overcome considerable odds to get entry-level jobs in tech and a shot at advancing through education, may still be left behind by a system that talks about inclusion and alternate paths to jobs yet acts in ways that run counter to these goals.